I was staring at the wilting leaves through the window, and for every leaf that fell, I nagged myself to go out and explore before winter spread its wrath. I wanted to capture the trees and the birds, fiery maples and mushrooms and other critters of the woods, before all that remained was bare sticks and stones, and a solemn gray sky. So I set out on a cold evening into the nearby woods. It was autumn, my first autumn. 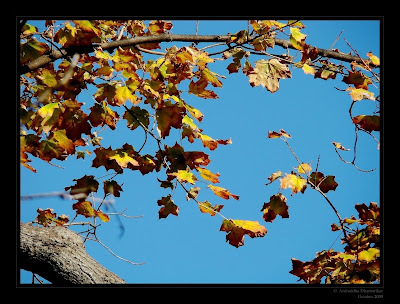 Back home in Western Ghats, I have only experienced a short fall season, where the deciduous trees shed their leaves – without a dramatic color-change – once Monsoon bids farewell. The heat and humidity rises to its peak, drying out the very life out of plants and animals. In Mumbai, it is known as the infamous ‘October heat’, a heat-wave that is worse than summer! 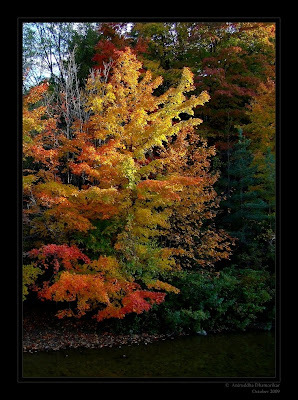 In Canada, summer is followed by autumn, where the monochrome green is transformed into myriad hues of yellows and reds. Canada is one of the best countries to observe the gradual change in the seasons, as the trees start to shut down, and animals retreat in their deepest winter dens. The weather was clear and bright, a mild breeze swept within the trees, carrying the leaves to its wintry grave, yet the grass was still green. It was a sight I had never seen. The temperature was falling, and not many animals were seen, except a few squirrels and birds. I treaded along Medway creek, a tributary of Thames River. It runs 214 km, and is a source of water for agriculture, it also serves as a provincially significant wetland; however, it is surrounded by houses and farms for most of its part. The trail hardly lasted an hour, since the light soon faded, but I was content by being in nature, away from those four walls of isolation. The sightings were very few, and I managed to take far less pictures than expected. Nonetheless, I saw a Downy Woodpecker pair, busy pecking the bark for food. It was a pretty sight, just beside a busy road – oblivious to the roaring vehicles and the people walking by. I went down the bridge, towards the water and was welcomed by curious Black-capped Chickadees. A flock of Mourning Doves perched high on a naked tree, watching me constantly, as I pointed my camera to shoot them. And American Robins that were as wary of me as a deer is of the tiger, but my intentions were different, of course! The American Robins are commonest birds seen here, and are so abundant – only next to European Starlings – that the bare tree in front of my balcony is full of them! These robins love rain, or are the harbingers of the rain. If I see one in the backyard or on the tree, one must know that rain is coming – soon! However, as days are beginning to grow cooler and nights colder, I see less and less of these robins. Flocks of European Starlings, on their lustrous wings, flung their mightiness in the sky, performing superb aerodynamics and displaying vivid patterns. 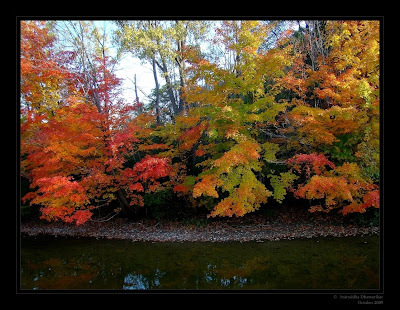 It is an introduced species in North America, and now has an abundant, established population in Ontario. It is not uncommon to see flocks of Starlings across the sky, and I have noticed mixed flocks of Starlings and Robins with absolute co-operation, solely to hunt efficiently. “Overall, the European Starling is listed by IUCN as being a species of least concern. However, it has been adversely affected in northern Europe by intensive agriculture… The overall decline has been attributed to a loss of food-rich permanent pasture, leading to low survival rates of young birds. 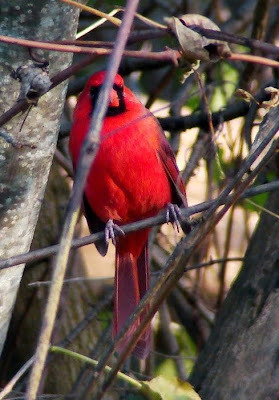 A lone male Northern Cardinal sat quietly across the creek, and the moment I pointed camera at him, he was gone! I also happened to run out of batteries and with a full memory card – all at the same time! I also glanced upon an interesting organism, that lays dormant – sitting at one place, secretly carrying out its activities of degradation and decomposition of the dead and decayed – a mushroom! 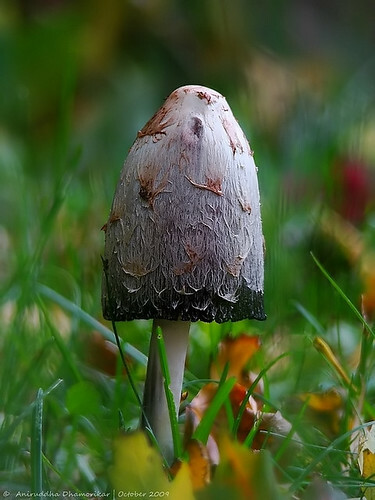 The Shaggy Ink-cap is the commonest mushroom seen in the backyard. The gills beneath the cap are white, then pink, then turn black and secrete a black liquid filled with spores (hence the “ink cap” name). This mushroom is unusual because it will turn black and dissolve itself in a matter of hours after being picked or depositing spores. I spent quite some time looking in the undergrowth for insects, but none ever showed up! By evening, the light fell on the tree canopy, setting it aglow, and the light filtered its way downwards, touching the water, relieving the coldness. The sun bid farewell to this tiny stretch of dense woodland, promising warmth for another day. 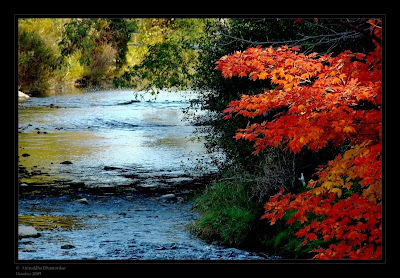 It was a refreshing walk, and I thoroughly enjoyed glancing upon the fauna of this place, along with the vibrant autumn transformation. 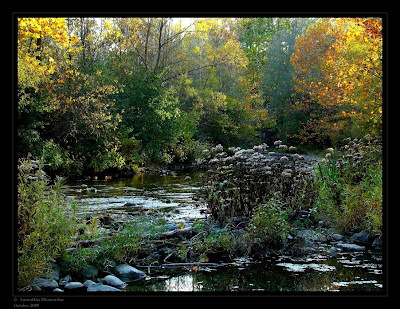 Medway Creek is as beautiful as Thames River, although smaller in volume. When it reaches north of London, it is already much polluted, yet it harbors several fishes, and is a source of water for the deer and other mammals. I experienced an eerie silence amidst the sublime melody of the flowing water and distantly chirping of birds. The wind sighed, the leaves rustled, but that silence is what consumed me. Hardly few yards from civilization, and this place seemed much distant, displaced, disconnected, unwanted and lost.